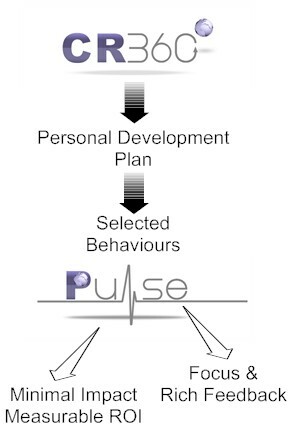 Pulse – The most effective way to monitor the progress of Personal Behavioral Development. Pulse is a mini 360° feedback survey where you can select up to six specific behaviours from your initial 360° report that the subject has committed to change. As you know a 360° report is the best indicator of an individual’s behaviours within a working environment. It can lead to greater understanding and commitment to personal and team development. Unfortunately, due to the breadth of coverage and organisational time required to produce an initial 360° report, there is an often a natural reluctance to repeat 360 appraisal on a regular basis within an organisation. The result is that this powerful tool is usually seen as a one-off intervention rather than the start of an ongoing Behavioural Development Programme. Coaching interventions and behavioural support programmes form an essential part of any serious behavioural change process. They are usually very effective and can provide huge value to the individuals concerned. However, it has been almost impossible to provide the organisation with quantitative evidence of the benefit of the coaching process. To overcome the drawbacks associated with standard 360° based interventions, CR Systems have introduced Pulse a mini 360 appraisal that can be run at almost any time through the personal development process. Pulse provides objective feedback on actual levels of individual change. Because Pulse only focuses on the behaviours that are being targeted, it is very quick and simple to complete for the people from whom you have requested feedback.